No, these aren’t your mother’s sauces–these are THE Mother Sauces. I mean, your mother may in fact make them, but maybe not. Anyway lately they’ve been everywhere in my life. Except in my kitchen–ain’t nobody got time for that! For those of you who don’t study French cuisine, they are the five sauces upon which all other sauces are made. And if you want a bit of THE Mother Sauces trivia, Hollandaise wasn’t added to THE Mother Sauce line-up until the turn of the 20th century. So why am I bringing up THE Mother Sauces? They’ve just been on my brain a lot lately. Mainly because of April, who is in culinary school and recently learned how to make and spice up THE Mother Sauces (although she says that the Sauce Tomat is so flavorful, you can just eat it as is), so I’ve been drooling with every descriptive email that she’s sent. And then last week, I watched The Hundred-Foot Journey. Have you seen it? If so, you know why I’m mentioning it in a post about THE Mother Sauces. If not, then add it to your Netflix queue. 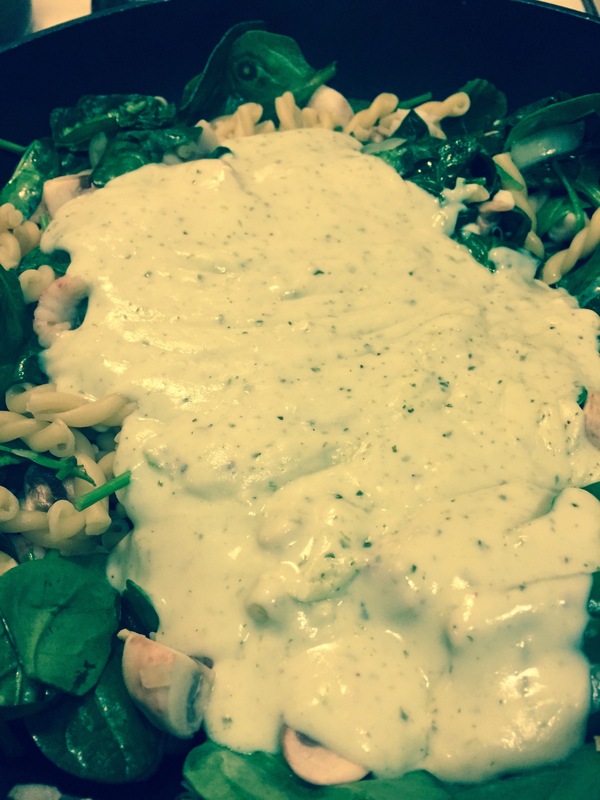 Anyway, I finally gave in and made some béchamel sauce last night….with a twist. That twist would be cilantro. And parmesan, although I think that parm is probably a frequent additive to béchamel–so we’ll just stick with the cilantro twist (April and Becca, stop making those nasty faces: cilantro is delicious!!). First, start with a simple béchamel sauce. I like to use Giada’s because it’s uber-easy! In a 2 quart saucepan, melt the butter over medium heat. Add the flour and whisk until smooth, about 2 minutes. Gradually add the warm milk, whisking constantly to prevent any lumps from forming. Simmer over medium heat, whisking constantly, until the sauce is thick, smooth and creamy, about 10 minutes. Do not allow the bechamel sauce to boil. Remove from the heat and stir in 1/2 teaspoon salt and a pinch each of white pepper and nutmeg. Season the sauce with more salt, pepper and nutmeg to taste. Okay, that’s Giada’s part. Then to that I add 1 cup of Parmesan and ½ cup of finely chopped cilantro–okay, I use more like a cup of cilantro–but it’s your béchamel, use however much you want. Same goes for the parmesan. Stir until cheese is melted and cilantro is thoroughly mixed in. Add to your favorite pasta and make your taste buds happy, happy, happy!